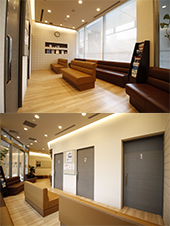 Japan's first specialized headache clinic, in which 5 headache specialists see patients and offer the best headache care. Doctor Fumihiko Sakai （Immediate past President of the Japanese Headache Society) serves as chief consultant.All of the 5 doctors are Boardcertified headache specialist. Our therapy includes not only drug treatment, but also treatment methods that are easy to start at home, such as yoga and physical exercise. Mini-lectures for outpatient are planned 1-2 times / year byinstructors (Headache specialist, psychosomatic medical doctor, counselor, pharmacist, physical therapist, nutritionist, yoga instructor, acupuncturist ) at the Tokyo Headache Clinic. Medical treatment of headache by expert doctors ・Accurate diagnosis by physician's medical interview and examinations by MRIand other equipment. Brain imaging is diagnosed by radiologists and neurologists. Other health problems related to internal medicine or neurology are also treated by board certified specialist of Internal Medicine and Neurology.